South Jersey Catholic Schools are united by a common mission: to educate and inspire young minds spiritually, academically and in service to others. While each school has a distinct culture and personality, there are opportunities for students join forces and share resources, demonstrating the power of shared goals and values. Camden Catholic High School’s motto is “College Starts Here.” To help students prepare for college and a 21st century career, the school has created the Leadership Academy, a collection of courses, retreats and programs designed to help students reach their potential. 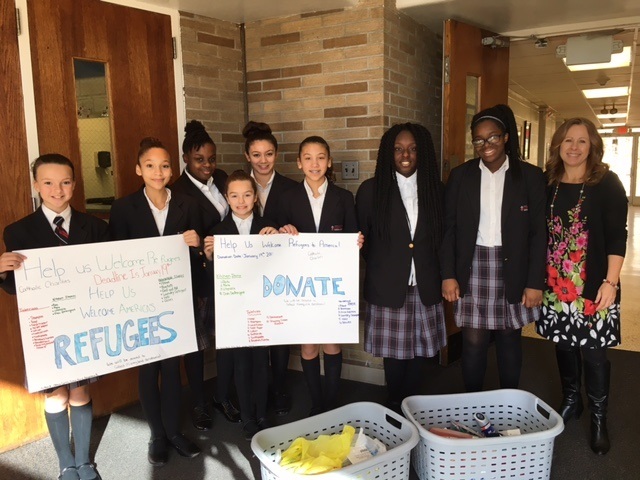 St. John Paul II Girl Power participants display some of the items collected for Catholic Charities in support of local refugees. Left to right: students Emily Heck, Angelina Rosario, Olivia Carns, Anaya Griffin, Ava Pilling, Gina Hurd, Naioma Burke, Chi Chi Otith, and moderator Christine Willard. Nine miles south, a group of sixth grade girls are finding their voices in “Girl Power: Developing the Leader in You,” a new elective at Saint John Paul II in Stratford. A recent session of Girl Power brought the two groups together, with Camden Catholic seniors Maura Gallagher and Sarah Robbins as guest speakers. Camden Catholic advancement director Kate Bieg agrees. ”It’s a great model for middle schoolers to see and think, ‘Wow, that could be me in a few years.’” Bieg and Willard coordinated to bring the two schools together. Gallagher and Robbins are not new to the world of sixth grade girls. They lead Irish Synergy, a leadership seminar for middle school girls sponsored by Camden Catholic each October as part of the Leadership Academy. They also remember sixth grade. “I would have loved a program like this,” said Robbins, referring to her own middle school years. She acknowledged that many “unfortunate events” can happen during those years, adding to girls’ insecurity. Robbins believes sixth grade is the perfect time to help girls develop a sense of empowerment and awareness of their own abilities. The high school duo began with a formal presentation and asked the girls what leadership means to them. Through that discussion and Gallagher’s personal story, the sixth graders began to share their views and feelings, shifting from presentation to conversation. The combined group talked about self-esteem and how it adds to being a leader. They shared common stories about being told they couldn’t do certain things or play certain games because they were girls – and not being taught to believe otherwise. In the context of faith, they explored skills and concepts designed to avoid stereotypes and build confidence. “You have to be confident to shed the light of Christ,” said Robbins. “Hopefully, the girls saw that… [and] appreciate all God has given to us,” added Gallagher. Faith is integral to Girl Power. By design, the course combines leadership with service. At the outset, the girls chose refugees as their area of focus and invited a speaker from Catholic Charities to help them understand the challenges refugees face. 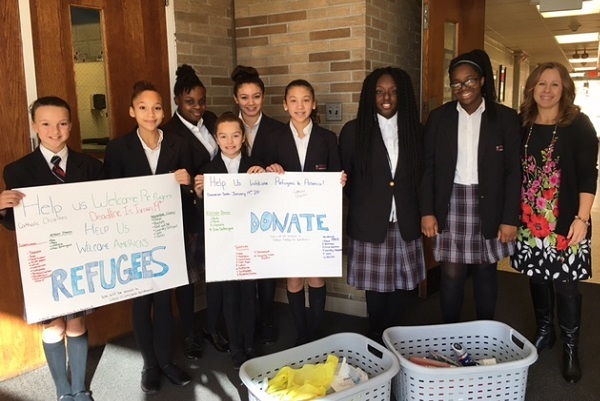 The girls then created work groups to plan their project, made posters, spoke in every classroom to solicit school-wide support, and have been collecting and sorting donations for refugee families in South Jersey. Musicians, singers, actors and artists will have a chance to gather at Saint Mary, East Vineland for the second annual CAB (Creative Arts and Beyond) Fair on May 16. Hosted by Saint Mary’s, the fair debuted in 2016, giving South Jersey Catholic school students a chance to showcase their talents and receive feedback and encouragement from professionals. Saint Mary’s art teachers, Grace Hoffner and Loren Train, developed the CAB program last year in an effort to promote enrichment programs throughout South Jersey Catholic schools.